Despite decades of public health outreach and education, more than 500,000 babies are born prematurely and an estimated 28,000 children die before their first birthday each year in the U.S. Many factors cause these negative outcomes, including health care access, poverty, and negative health behaviors, but research supports that increasing knowledge around health can help people stay healthier. To help more pregnant women and new moms get information about caring for their health and giving their babies the best possible start in life, the National Healthy Mothers, Healthy Babies Coalition (HMHB) launched text4baby, the first free health text messaging service in the U.S.Text4baby supports moms by providing accurate, text-length health information and resources in a format that is personal and timely, using a channel she knows and uses. Over 85% of Americans own a cell phone and 72% of cell users send or receive text messages. Registration is easy and can be done online here or from your cell phone. Use your cell phone to text the word BABY (or BEBE for Spanish) to the number 511411. You’ll be asked to enter your baby’s due date or your baby’s birthday and your zip code. Once registered, you will start receiving free messages with tips for your pregnancy or caring for your baby. These messages are timed to your due date or your baby’s birth date. If you are pregnant and your due date changes, text UPDATE to 511411 to enter your new due date. Once you have your baby, be sure to text in UPDATE with your baby’s birthday so you keep getting messages through baby’s first year. If you want to stop receiving messages from text4baby, text STOP to 511411. To start receiving the messages again, you will have to enroll again by sending BABY to 511411 (BEBE to 511411 for Spanish messages). 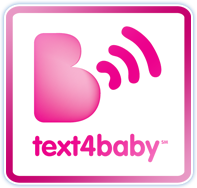 Thanks to the support of CTIA – The Wireless Foundation and participating mobile operators, all messages you receive from text4baby are free! Even individuals without a text messaging plan can get these messages for free. If someone has limited texts per month, text4baby won’t take away from that limit. As long as you have service with one of the carriers listed below, text4baby is free for you. For further information, please visit http://www.text4baby.org/. The Virginia Infant & Toddler Specialist Network on-site services include individualized consultation, targeted training, classroom-focused mentoring, and feedback as well as resources and materials related to increasing the quality of care provided to infants and toddlers.